Doug Acker & Tara Krieger were brought together by fitness in 2002. In fact, if you ever think Coach Tara is tough on you – just imagine what Doug went through – she was his personal trainer before she became his girlfriend and business partner. Doug, a lifelong entrepreneur and owner of United Chimney Corp., became a resource for Tara when she began to express her interest in opening a gym. (He also became her boyfriend). Tara was passionate about opening a facility where she could provide the same care and level of training to every person who walked through the door. She wanted to know their goals and help them find a way to accomplish them. As she continued to search for more knowledge and different ways to approach fitness she found CrossFit – the solution she had been looking for. “She kept inviting me to go try a class with her, but at first I didn’t show much interest,” says Doug. 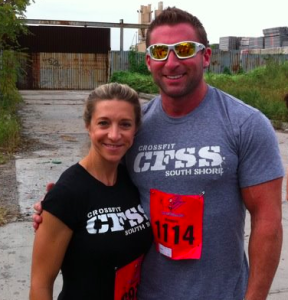 Together, Doug & Tara opened the doors of CrossFit South Shore in 2009. To this day, they still coach nearly ALL classes to help ensure that Tara’s standards of professionalism and experience are upheld. They’ve helped many people lose weight, gain muscle, and get healthy, but most importantly they’ve helped people find a place where they are happy & motivated to achieve their goals!